We’d love your help. Let us know what’s wrong with this preview of Fast Ships, Black Sails by Ann VanderMeer. Do you love the sound of a peg leg stomping across a quarterdeck? Or maybe you prefer a parrot on your arm, a strong wind at your back? Adventure, treasure, intrigue, humor, romance, danger — and, yes, plunder! Oh, the Devil does love a pirate — and so do readers everywhere! Swashbuckling from the past into the future and space itself, Fast Ships, Black Sails, edited by An Do you love the sound of a peg leg stomping across a quarterdeck? Or maybe you prefer a parrot on your arm, a strong wind at your back? Adventure, treasure, intrigue, humor, romance, danger — and, yes, plunder! Oh, the Devil does love a pirate — and so do readers everywhere! Swashbuckling from the past into the future and space itself, Fast Ships, Black Sails, edited by Ann and Jeff VanderMeer, presents an incredibly entertaining volume of original stories guaranteed to make you walk and talk like a pirate. To ask other readers questions about Fast Ships, Black Sails, please sign up. Boojum / Elizabeth Bear & Sarah Monette -- Castor on troubled waters / Rhys Hughes -- I begyn as I mean to go on / Kage Baker -- Avast, abaft! / Howard Waldrop -- Elegy to Gabrielle, patron saint of healers, whores, and righteous thieves / Kelly Barnhill -- Skillet and saber / Justin Howe -- Nymph's child / Carrie Vaughn -- 68* 07' 15" N, 31* 36' 44" W / Conrad Williams -- Ironface / Michael Moorcock -- Pirate solutions / Katherine Sparrow -- We sleep on a thousand waves beneath the stars / Brendan Connell -- Voyage of the Iguana / Steve Aylett -- Pirates of the Suara Sea / David Freer & Eric Flint -- Cold day in hell / Paul Battieger -- Adventures of Captain Black Heart Wentworth / Rachel Swirsky -- Araminta, or, the wreck of the Amphidrake / Naomi Novik -- Whale below / Jayme Lynn Blaschke -- Beyond the sea gate of the scholar-pirates of Sarskoe / Garth Nix. I'm not the target audience for this collection because I am not interested in or sympathetic to pirates and piracy. I got the book to read stories by a couple authors I've enjoyed before. Adventures of Captain Black Heart Wentworth / Rachel Swirsky -- Oh, this is a about pirate rats. I don't like rats, or anthropomorphic animal stories in general. Skip. Beyond the sea gate of the scholar-pirates of Sarskoe / Garth Nix -- Boring. Too many descriptions for the amount of story, or something. I've read a couple other of Nix's with this duo with the puppet and liked them more, although less than his puppet-free novels. After slogging through the first story in this collection, I realized that rather than make myself grind through the whole book, I could just read the one story I checked it out from the library for: the one by Naomi Novik, which was excellent. And now, mission accomplished, I can take the book back, guilt-free! This may seem like a duh thing to most of you, but I feel very adult and proud of this revelation. "Boojum," by Elizabeth Bear and Sarah Monette. A low-level grunt on a living space-ship grows increasingly uneasy about their latest cargo. "Skillet and Saber," by Justin Howe. Hilarious tale of the cook's apprentice on a pirate ship. So good that I intend to seek out more of Howe's work. "Pirate Solutions," by Katherine Sparrow. Futuristic coders start drinking bone rum and become old-fashioned pirates--but they hack instead of sail. I was initially wary of this premise, but Sparrow makes it work. "Pirates of the Suara sea," by David Freer and Eric Flint. A female sea-captain (reminiscent of Malcolm Reynolds) does some clever dancing to defeat the pirates who overtake her ship. Good world-building (particularly rare in a short story) and characterization. "The Adventures of Captain Black Heart Wentworth: A Nautical Tail," by Rachel Swirsky. Two crazed rats are the last of their pirate ship--and when one of them falls in love with a mercenary cat, it could be the last of them, as well. Funny, whimsical, but probably not everyone's cup of tea. I loved the world building and the main character, the story has the potential for a proper novel. The world setting is similar to ours 17th-18th century earth, time of ships and pirates, only this world has other wonders and dangers afloat, magic and beasts the likes of Leviathan. The plot revolves around our protagonist, a young woman sailing to meet her betrothed. She is one of the best characters I have come across, feisty, adventurous, fun, headstrong, resourceful. Its a story written with humor in mind. The story did have some problems, it did get confusing sometimes as the spell and how it works along with the world customs are not explained clearly, you get to know of it as the sorcerer happens. I’ve only read a few of these stories so far, and I don’t usually enjoy short stories that aren’t part of a larger series, so don’t put much stock in my rating. "Boojum" by Sarah Monette and Elizabeth Bear - a living spaceship run by a pirate crew. "I Begyn As I Mean To Go On", Kage Baker. She was a hell of a writer and this is a good read, although the opening scene is the best part. "Araminta, or, The Wreck of the Amphidrake" by Naomi Novik. Fantasy, cyberpunkish I’ve only read a few of these stories so far, and I don’t usually enjoy short stories that aren’t part of a larger series, so don’t put much stock in my rating. "Araminta, or, The Wreck of the Amphidrake" by Naomi Novik. Fantasy, cyberpunkish setting, with a feisty heroine who sees a pirate attack as opportunity rather than tragedy. I resisted buying this for a long time, because I am really not a short story person and thus don't usually get along well with anthologies, but eventually I broke down and bought it. It turned out to be rather a mixed bag: some really good stuff, especially near the beginning and the end, but some I was less enthralled by (and a couple I frankly skipped, after reading a page or two and not being hooked). I really liked Elizabeth Bear and Sarah Monette's "Boojum", about a living spaceship and one I resisted buying this for a long time, because I am really not a short story person and thus don't usually get along well with anthologies, but eventually I broke down and bought it. It turned out to be rather a mixed bag: some really good stuff, especially near the beginning and the end, but some I was less enthralled by (and a couple I frankly skipped, after reading a page or two and not being hooked). I really liked Elizabeth Bear and Sarah Monette's "Boojum", about a living spaceship and one of her crew; Naomi Novik's (non-Temeraire-related) "Araminta, or, The Wreck of the Amphidrake" and its heroine who starts out as a lady and ends up as a pirate (but in an unexpected way); and Rachel Swirsky's "The Adventures of Captain Black Heart Wentworth", a tale of piratical rats (and one cat). I liked the conceit behind Howard Waldrop's "Avast, Abaft! ", which begins with Captain Rackstraw of the Pinafore chasing the famous Pirates of Penzance, but ended up finding it disappointingly short and slight. Like most short story collections, this one is a decidedly mixed bag. A few are incredible, while the others barely mediocre. The rest of the collection I cannot begin to recommend, even as a way to pass the time. The stories I liked I really really liked...particularly "Araminta, or, The Wreck of the Amphidrake" by Naomi Novik (awesome, awesome heroine) and "A Cold Day in Hell" by Paul Batteiger, where the ocean froze over at the turn of the 17th century and ships catch the wind but slide on skates. I read Araminta out loud to a friend, and was intrigued by the different way I understood the story, speaking it instead of reading it to myself. It made everything more immediate, since I couldn't stop and lo The stories I liked I really really liked...particularly "Araminta, or, The Wreck of the Amphidrake" by Naomi Novik (awesome, awesome heroine) and "A Cold Day in Hell" by Paul Batteiger, where the ocean froze over at the turn of the 17th century and ships catch the wind but slide on skates. I read Araminta out loud to a friend, and was intrigued by the different way I understood the story, speaking it instead of reading it to myself. It made everything more immediate, since I couldn't stop and look back to doublecheck anything or stop and think further about what had just happened. This collection is a mixed bag. It started fairly well, but after the first story dropped off until about 2/3 of the way through. After that it was strong again, but the drop off was a bit too much to rate this book any higher. Stories worth a read were from these authors. The rest I didn't find worth the time. Some of the more notable stories here were "Boojum" by Elizabeth Bear and Sarah Monette; "The Nymph's Child" by Carrie Vaughn; "Araminta, or, the Wreck of the Amphidrake" by Naomi Novik; "The Adventures of Captain Black Heart Wentworth: A Nautical Tail" by Rachel Swirsky; "The Whale Below" by Jayme Lynn Blaschke. On the whole, easily digested and easily forgotten. This was a somewhat mediocre collection of pirate stories. They all involve pirates somehow, a number of them were fairly traditional pirate stories. My favorite of the bunch was “Elegy to Gabrielle, Patron Saint of Healers, Whores, and Righteous Thieves” by Kelly Barnhill this was a beautiful story that was masterfully told. Others in this collection that I really enjoyed were: “Boojum” by Elizabeth Bear and Sarah Monette, “Skillet and Saber” by Justin Howe, “The Nymph’s Child” by Carrie Vaughn, This was a somewhat mediocre collection of pirate stories. They all involve pirates somehow, a number of them were fairly traditional pirate stories. Others in this collection that I really enjoyed were: “Boojum” by Elizabeth Bear and Sarah Monette, “Skillet and Saber” by Justin Howe, “The Nymph’s Child” by Carrie Vaughn, “Ironface” by Michael Moorcock, “Pirate Solutions” by Katherine Sparrow, “Araminta, or, The Wreck of the Amphidrake” by Naomi Novik, and “Beyond the Sea Gate of the Scholar-Pirates of Sarskoe by Garth Nix. Overall while there were a few really good stories, most of them were mediocre at best. Please see below for the full list of stories and a quick review of each story. This was a fun story about an engineer on a living spaceship. There was some good irony in here and the story was very creative and interesting. This was an okay story about a man who looses a card game. He goes to the cash machine to get money to pay his buddies and when he gets back he has quite the tale to tell about why he doesn’t have the money. It was set in modern times and was kind of a “fish” story type of story. A story about some ex-slaves who sign on to work on a pirate ship were the Captain seems to be cursed. They follow rumors to an island full of riches only to be surprised by what they find there. This was a pretty typical pirate story and was okay. I read the first few pages of this story and it was an absolute mess. It was jumping around between a captain trying to tell his history and a constant pursuit of some other ship...and parts were told in rhyme. I ended up skipping the rest of it. This was an amazingly beautiful story about a magical young woman who was part pirate and part saint. I absolutely loved it. This was a decent story about a young man who becomes assistant to a ship’s cook. He ends up in a cook-off against another ships cook as he fights for his life. A story about a woman who escapes death by hanging and seeks a quiet life in a fishing village. However, her daughter seeks the exact same life that her mother ended up leaving behind. This was well written and easy to read. In this story a pirate is trying to track down an evil pirate and take revenge on him. The story seemed a bit pointless and didn’t have any resolution. I feel like I missed something here but I am not sure what. Well done story about an intergalatic space pirate who decends to Venus to get paid his tribute. I was impressed at how much world-building Moorcock accomplished with just a few short pages of story. This was a very creative story about a punch of computer programmers/hackers who drink a bottle of run with a pirate bone in it. This convince them all to be pirates and shows them visions of other previous pirates. They end up starting their own strange programmer pirate colony on an abandoned island. In this story some pirates end up on a strange island where they capture a strange native girl. When typhus hits the boat and takes many lives, the girl undegoes a strange transformation. It was okay but not great. This was a collection of entries from a journal found about some pirates aboard the Iguana. They apparently went crazy at sea. None of it made much sense at all and I almost stopped reading it. This is a pirate story set on a different planet. It was okay. This was a typical pirate story. I read the first few pages of it, though it was boring and stopped. This story was about a bunch of rat pirates. I thought it was boring and only read the first few pages and then stopped. It was okay just very juvenile sounding. I enjoyed this story about a young noblewoman sent off to marry. When the ship she is on is attacked by pirates she dones a magical amulet to appear male and joins them on their adventures. I read a bit of this story and thought it was boring so I skipped the rest ofit. It involved a lot of airship battles. I really enjoyed this story about a warrior and a puppet who seek the aid of a pirate ship to find a mysterious treasure. Excellent world-building, very creative, and well done characters made this a great story. A great anthology of pirate tales. Quite varied in style and substance. Some I loved, some I only liked...but well worth the read. Some traditional pirate stories, some pirate stories with a twist. All fall within the fantasy or sf genre. If you like pirate stories, you'll love this book of short stories. The stories by Nix, Novik, Batteiger and Baker were the best and more than a few of the others were worth reading. There were unfortunately a handful of stinkers too. I rated each story and they averaged out to 2.88, which rounds up to three stars. Hmm, manā kopijā bija tikai viens stāsts, bet bija ok. Varbūt varētu būt vairāk sižeta pavērsienu, bet varbūt apjoms ierobežo. As with most anthologies, there were a few I didn't like, but overall it was a good collection. I like how broad the definition of pirate got (space pirate, yay). A fair amount of dulse but an equal amount of oysters, and a few very lovely pearls. An enjoyable collection of short stories about pirates. I'll write a full review soon. An anthology of stories of pirates, in a wide variety of settings. What the best stories seem to have in common is a use of pirates as a background to the story. “Boojum” by Elizabeth Bear and Sarah Monette. Piracy aboard a living ship. “Castor on Troubled Waters” by Rhys Hughes A very tall tale of piracy at the local pub. “I Begyn as I Mean to Go On” by Kage Baker The newest members of a pirate crew follow a truly unlucky pirate captain. “Avast, Abaft!” by Howard Waldrop The Pirates of Penzan An anthology of stories of pirates, in a wide variety of settings. What the best stories seem to have in common is a use of pirates as a background to the story. “Avast, Abaft!” by Howard Waldrop The Pirates of Penzance do battle with the crew of the Pinafore, with two ghostly interruptions. “Elegy for Gabrielle, Patron Saint of Healers, Whores and Righteous Thieves” by Kelly Barnhill The daughter of a miraculous woman becomes a miraculous pirate. “Skillet and Saber” by Justin Howe Insanely awful cook has to defend his cooking. “The Nymph's Child” by Carrie Vaughn The tale of the only one to sail the Iron Teeth. “68˚ 07' 15" N, 31˚ 36' 40"W” by Conrad Williams Obsession drives the Captain's hunt for a pirate to the poles of the Earth. “Iron Face” by Michael Moorcock A short mood piece on an interstellar pirate. “Pirate Solutions” by Katherine Sparrow Internet piracy is more than just a metaphor. “We Sleep on a Thousand Waves Beneath the Stars” by Brendan Connell A pirate ship picks up an unusual woman on a remote island. “Voyage of the Iguana” by Steve Aylett Captain's log of humorously disastrous voyage. “Pirates of the Suara Sea” by David Freer & Eric Flint Pirates attack ships on another planet. “A Cold Day in Hell” by Paul Batteiger A hunt for a Blackbeard-style pirate on frozen oceans. “The Adventures of Captain Blackheart Wentworth” by Rachel Swirsky Shipboard life and piracy in the animal kingdom. “Araminta, or, The Wreck of the Amphidrake” by Naomi Novik Sorcery and ransom for a hostage. “The Whale Below” by Jayme Lynn Blaschke The pirate vessel discovers why the ship it is looting was abandoned. “Beyond the Sea Gate of the Scholar-Pirates of Sarskoe” by Garth Nix A raid is made upon a magically guarded keep. It's a nice mix of stories, from the fantastic to the science fictional (as usual, the Howard Waldrop is close to indescribable; as all of the characters come from theatrical works, perhaps “alternate theater” will do?). I expected some of the stories to be disappointments but was pleasantly surprised in most cases. For example, piracy in space is pretty silly to me, so I wasn't expecting much from the story by Bear and Monette, but it took an interesting twist when mid-way through the story I realized that the background was based on Lovecraft. I chose Fast Ships, Black Sails because I love fun Pirates of the Caribbean style swashbuckling and several authors I like (Sarah Monette, Naomi Novik, and Garth Nix) had contributed stories. It was a bit of a slog to get through, especially in the middle, and overall I found it to be a tepid sort of mixed bag – most stories were at least okay but there was nothing I really loved. Boojum by Elizabeth Bear and Sarah Monette – Space pirates in a living sailfish ship are set upon by brain-harvesting I chose Fast Ships, Black Sails because I love fun Pirates of the Caribbean style swashbuckling and several authors I like (Sarah Monette, Naomi Novik, and Garth Nix) had contributed stories. It was a bit of a slog to get through, especially in the middle, and overall I found it to be a tepid sort of mixed bag – most stories were at least okay but there was nothing I really loved. Boojum by Elizabeth Bear and Sarah Monette – Space pirates in a living sailfish ship are set upon by brain-harvesting aliens. Creative, fascinating, and disturbing. 4 stars. Castor on Troubled Waters by Rhys Hughes – A tall tale involving pirates told by a pub goer as an explanation for why he can't pay them back. Random and rambling - not a fan of the structure. 2 stars. I Begyn As I Mean to Go On by Kage Baker – A pirate crew look for a gem mine on an island where all the native workers supposedly died of smallpox years ago. Yay for smallpox, boo for 'murderous natives' cliche. 3 stars. Avast, Abaft by Howard Waldrop – A pirate crew being chased by the Royal Navy runs into another pirate ship anchored off a mysterious island. 90% references to other stories, most of which I didn't get. 2 stars. Skillet and Saber by Justin Howe – An unlucky young pirate becomes the apprentice of a mad cook who talks to his magical saucepan. Cool setup but it's one of those 'and everything was terrible' stories. 3 stars. The Nymph's Child by Carrie Vaughn– A female pirate who escaped the noose years ago tries to stop her daughter from following in her footsteps. Romantic and swashbuckling – it's Pirates of the Caribbean: the Next Generation. 4 stars. 68 07' 15” N, 31 36' 44” W by Conrad Williams – A mad captain follows the pirate who murdered his crew to the arctic in a quest for revenge. The main character is crazy so I wasn't sure what's going on, especially at the end. 2 stars. Ironface by Michael Moorcock – A space pirate descends to a Venice-like planet to collect tribute. Interesting, but reads like an encyclopedia entry. 2 stars. Pirate Solutions by Katherine Sparrow – A trio of hackers form a coding collective on a tropical island where magical rum allows them to hallucinate that they are golden age pirates. Bizarre attempt to make computers not boring. 2 stars. We Sleep on a Thousand Waves Beneath the Stars by Brendan Connell – A pirate crew begins to fall ill one by one after they capture a native woman with a mouth on her stomach. Written in a poetic style I didn't care for. 1 star. Voyage of the Iguana by Steve Aylett – The logbook of a merchant ship detailing their bizarre exploits after everyone goes mad. Hilarious, if a bit too long. 4 stars. Pirates of the Suara Sea by David Freer and Eric Flint – The captain of a fishing boat on an ocean planet turns the tables on the pirates that attempt to rob them. A bit like Firefly crossed with Waterworld. 3 stars. A Cold Day in Hell by Paul Batteiger – The Royal Navy hunts pirates in sailing ships that skate across the surface of a long-frozen ocean. Cool (haha, get it?) world setup with a pretty standard plot. 3 stars. The Adventures of Captain Black Heart Wentworth by Rachel Swirsky – A pair of piratical rats take to the open ocean in a homemade boat to prey on other rodent crews. Sounds like it should be cute and funny but is actually gruesome and brutal. 2 stars. Araminta, or, The Wreck of the Amphidrake by Naomi Novik – The daughter of a wealthy family disguises herself as a man when pirates attack her ship and escapes her confining life. Interesting world, fun story, open-minded characters. 4 stars. In the VandeMeer Anthology pirates have moved into space and beyond, chartering the vast unknowns while making their livelihood at what they know best. Within these covers is the perfect pirate story for any reader, presenting classic and unique stories of buccaneers sailing the seas of the cosmos. Boogum by Elizabeth Bear and Sarah Monette – This is about piracy in space with unusual cargo taken from a captured freighter and a semi-sentient spaceship with Captain Black Alice who finds herself ma In the VandeMeer Anthology pirates have moved into space and beyond, chartering the vast unknowns while making their livelihood at what they know best. Within these covers is the perfect pirate story for any reader, presenting classic and unique stories of buccaneers sailing the seas of the cosmos. Boogum by Elizabeth Bear and Sarah Monette – This is about piracy in space with unusual cargo taken from a captured freighter and a semi-sentient spaceship with Captain Black Alice who finds herself making a sacrifice. Castor on Troubled Waters by Rhys Hughes – comic story of pirates and gambling debts well told. I Begyn as I Mean To Go On by Kage Baker – a creepy classic pirate story. Two castaways are taken onto a ship, Martin Luther, whose captain has a bad reputation. By the law of the sea they are obliged to work on the ship, and things become interesting when they find their way to an ancient emerald mine in South America. Avast, Abaft! by Howard Waldrop – found this one humorous and similar in nature to the HMS Pinafore and the Pirates of Penzance. Elegy to Gabrielle, Patron Saint of Healers, Whores, and Righteous Thieves by Kelly Barnhill – about a woman with the ability to use magic whose daughter belongs to the sea. Skillet and Saber by Justin Howe – a new sailor on a ship is assigned as the cook’s apprentice with some comedic episodes. The Nymph’s Child by Carrie Vaughan– This is a story of a woman who poses as a man to be allowed to go to sea, and when caught by pirates must give up her daughter. 68° 07' 15" N, 31° 36' 44" W, by Conrad Williams provides a horror story about Captain Low on a revenge mission after his crew is slaughtered. Ironface by Michael Moorcock – A very short piece about pirates in space on a trip to Venus that I felt should have been longer. Pirate Solutions by Katherine Sparrow – This is an experimental piece about computer analysts who drink from a bottle of rum to become pirates, and setting sail in an old ship with masts. When they reach their isolated island, and dig up a treasure chest full of ancient rum bottles, they send out messages in bottle which in turn, bring other computer geeks from around the world to join them. We Sleep on a Thousand Waves Beneath the Stars by Brendan Connell – A story about hungry pirates who don’t discriminate over what they eat. Voyage of the Iguana by Steve Aylest – A story with a weird list of journal entries on said voyage with mishaps. This I found boring. Pirates of the Suara Sea by David Freer and Eric Flint – This is a about space pirates in an alien sea where the vessel is manned by a woman captain. She manages to jettison part of the cargo when the pirates arrive, with special plans for the intruder’s captain. A Cold Day in Hell by Paul Batteiger – provides a unique setting with three masted sailing ships on ice skates whizzing across frozen seas. Two ships leave Boston on an expedition to capture The Queen’s Revenge and its captain Frost, considered to be more monster than human. The Adventures of Captain Black Heart Wentworth: a Nautical Tail by Rachel Swirsky – This story is great fun, featuring rat pirates and later a shipwrecked cat who had eaten her previous lover. Araminta, or, The Wreck of the Amphidrake by Naomi Novik – An alternative Earth awaits the reader where England is ruled by Roman deities and the sacrifices of women are dominated by mens’ will. Araminta, the daughter of an important noble is kidnapped by pirates, but she has a few unique abilities to assist her in outwitting them. The Whale Below by Jayne Lynn Blaschke – An alien story of a pirate spaceship seizes a ‘whaler’ ship only to find no one on board. Beyond the Sea Gate of the Scholar-Pirates of Sarsköe by Garth Nix – This story is about a gentleman rogue and his magical puppet facing a priestess who happens to be a cannibal. There are some interesting scenes with shapeshifters. I usually avoid mixed short story collections. Even when a single author writes every story in a collection, the results can be mixed. But if you like the author, then you will usually like the overall collection. With a different author contributing each story, the chance for positive results drastically decreases. Fast Ships, Black Sails is a prime example of this. The good aspect of having so many different authors writing such a wide range of stories is that you're almost guaranteed to find I usually avoid mixed short story collections. Even when a single author writes every story in a collection, the results can be mixed. But if you like the author, then you will usually like the overall collection. With a different author contributing each story, the chance for positive results drastically decreases. Fast Ships, Black Sails is a prime example of this. The good aspect of having so many different authors writing such a wide range of stories is that you're almost guaranteed to find something you like. If you like pirates, you'll like at least one of these stories. I've never heard of any of these authors (and it appears that most of them have only published a single book at the time of printing), so I've found some potential new authors whose work I might like. That's all great. On the other hand, the problem with a grab bag is that you don't always pull out a jewel or a gold coin. Sometimes, you get a petrified dog turd. And there are a few of them in this bag. It's pointless to review each story one by one (of you want to, go ahead, but I've already returned the book to the library and don't want to confuse one story for another). Moreover, what I liked might be what others don't, and what I hated, others might enjoy. That's the appeal of this kind of book, but I don't see the value. If you know you're going to like a particular story, you'll cut straight to it. If, like me, each author and story was a shot in the dark, you're going to have to slog through the stinky hands for the "ooh, shiny" moments. The good news is that the range of stories here is worthwhile. Some are sci fi, some are more fantasy, some are closer to historical fiction or magical realism. All are valid choices to appeal to a wide range of readers, if they aren't all good stories. If you like pirates, it's a good collection to pick up. If you like a particular author, it's probably with it. If you don't know any of the writers from Adam and don't really care about pirates, there are other collections that would be better. I'd still prefer a collection of stories written by a single author I know I enjoy rather than this hodgepodge of hit-or-miss. FAST SHIPS, BLACK SAILS EDITED BY ANN AND JEFF VANDERMEER: While this may not be the first pirate story anthology, Fast Ships, Black Sails doesn’t hold back, with its captivating cover featuring a classic pirate standing proud at the prow of his ship, while small glowing-eye dragons fly around, a tiny dragon skeleton sits on his shoulder, and in the cloudy distance is what appears to be a ghost pirate ship. 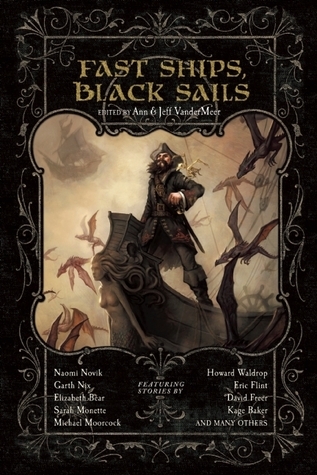 This collection edited by Ann and Jeff VanderMeer features a combination of classic swash FAST SHIPS, BLACK SAILS EDITED BY ANN AND JEFF VANDERMEER: While this may not be the first pirate story anthology, Fast Ships, Black Sails doesn’t hold back, with its captivating cover featuring a classic pirate standing proud at the prow of his ship, while small glowing-eye dragons fly around, a tiny dragon skeleton sits on his shoulder, and in the cloudy distance is what appears to be a ghost pirate ship. This collection edited by Ann and Jeff VanderMeer features a combination of classic swashbuckling pirate tales, as well as fascinating stories of the fantastic from authors like Conrad Williams, Garth Nix, Elizabeth Bear, and many more. In the opening story, “Boojum” from Elizabeth Bear and Sarah Monette – possibly the best in the collection – we are in space, and the mighty spaceships are living entities that grow and change and have mouths; they are biomechanical. The authors do an excellent job of creating an interesting world that leaves the reader wanting more. In Naomi Novik’s -- author of the successful Temeraire series – “Araminta, or, The Wreck of the Amphidrake,” the daughter of a very important noble is kidnapped by pirates and thought murdered, but Araminta is a special woman with some unique powers allowing her to outwit the pirates who have taken her hostage. In Michael Moorcock’s too short story “Ironface,” there are pirates in space and Ironface is the most feared in the solar system, who makes the trip to Venus to accept the expensive bribe that he collects each decade, then his ship, Pain, floats back out into the dark realms of space. Fast Ships, Black Sails has the perfect pirate story for any reader, as it presents both the classic and the unusual stories of privateers and buccaneers sailing the high seas, as well as the dark matter clouds of the cosmos. Die Herausgeber haben Mut: Direkt die erste Geschichte ist eine reinrassige Science-Fiction-Story, und sie setzt die Richtung, in die alle Geschichten dieser Sammlung gehen. Wer auf der Suche nach den klassischen Piraten mit Papagei und Hakenhand ist, muss sich woanders umschauen, denn in "Fast Ships, Black Sails" wird kreativ und mit viel Augenzwinkern mit dem Thema Piraterie umgegangen. Von der schon erwähnten Auftaktgeschichte "Boojum", die Weltraumpiraten auf ihrem lebenden Raumschiff zeigt, über eine sehr gelungene Art, sich um Spielschulden zu drücken ("Castor on Troubled Waters"), bis hin zu den in die Realwelt eingebetteten fantastischen Seedrachen, Meerjungfrauen oder anderen fantastischen Wesen wie in "We Sleep on a Thousand Waves Beneath the Stars" spannt sich ein weiter Bogen über alle Zeiten und Orte. Die Qualität ist dabei durchgängig hoch, und jede der 18 Kurzgeschichten unterhält den Leser in einer eigenen und immer wieder überraschenden Art und Weise. Verschiedene Genres lockern das ganze auf - Science Fiction trifft auf Horror ("68°07'15''N, 31°36'44''W") oder auf abstrusen Humor ("Voyage of the Iguana"). Bücher aus dem Nightshade-Books-Verlag haben leider alle das billige Papier und den Kartoneinband, der sich sofort eindreht, gemeinsam, und auch hier ist das der Fall. Das angenehme Druckbild (leider mit etwas zu wenig Weißraum) und die tolle Coverillustration trösten etwas darüber hinweg. I meant to write this review with the book in my hands, which is really the only way I can properly review any anthology. Alas, the volume had to be returned to the library before that happened (and before that, Sam was enjoying it). As it is, some stories just didn't register strongly enough for me to remember them. On the other hand the stories I do recall were really, really good, and if I could rate them on their own they'd get 4s and 5s. I'd read Elizabeth Bear and Sarah Monette's "Boojum" on I meant to write this review with the book in my hands, which is really the only way I can properly review any anthology. Alas, the volume had to be returned to the library before that happened (and before that, Sam was enjoying it). As it is, some stories just didn't register strongly enough for me to remember them. I'd read Elizabeth Bear and Sarah Monette's "Boojum" online, but it was so good that I read it again. I adore their work (individually and together). That story was actually the only reason I even considered reading the book, as I'm not really much of a pirate fan. I'm not into too much darkness in my leisure reading, and I don't like antiheroes. Next, "Pirate Solutions" by Katherine Sparrow was so good that I insisted that Sam read it. RIGHT THEN. I think Katie would have enjoyed it, too. It should be added to the "poly culture" lists. I'll be looking for more of Sparrow's work! Naomi Novik's "Araminta, or, The Wreck of the Amphidrake" was all right, and I do remember it. It just didn't really toast my bread—possibly because I found Araminta to be an annoying brat. "Elegy for Gabrielle, Patron Saint of Healers, Whores and Righteous Thieves" by Kelly Barnhill was absolutely lovely. I can't describe it beyond that without spoiling it for you, which would be criminal. Carrie Vaughn managed to make me cry with "The Sea Nymph's Child." It was especially poignant to me right now, at this point in the parenting process. We may well end up buying a copy of this one. It's certainly worth the cover price! A collection of speculative pirate stories -- not without flaws, but far better than average. Naomi Novik's "Araminta, or the Wreck of the Amphidrake," a marvelous age-of-sail-with-sorcery story where the plucky heroine, instead of being rewarded only with a chance to vanish into a stifling marriage with the man she likes rather than the one she hates, actually gets the life you'd wish for her. Katherine Sparrow's "Pirate Solutions," in which a bunch of geek programmers are transformed A collection of speculative pirate stories -- not without flaws, but far better than average. Katherine Sparrow's "Pirate Solutions," in which a bunch of geek programmers are transformed into pirates (though I'd like very much to know exactly what the code they're writing actually does). A bit of nonexplicit but nice M/F/F in this story is why I tagged the collection slash-interest. Elizabeth Bear and Sarah Monette's "Boojum," sf with living, sentient pirate ships that eat their enemies. Rhys Hughes' "Castor on Troubled Waters," which is basically a pub joke, but a funny one. Kage Baker's "I Begyn As I Mean To Go On," a revenge tale of a fairly traditional sort where innocents stumble into a guilty party's just desserts, and David Freer and Eric Flint's "Pirates of the Suara Sea," where the fun is seeing the trap sprung from the POV of the avenger. Where stories go wrong, it's either because they're all quirky or romantical atmospherics that add up to nothing or because they wildly overestimate the hilariousness of their premise.